Blues and Jazz Festival: It's Green! Can the Blues be Green? Kermit the Frog once said, "It ain't easy being green," but I'm not sure if he knows how right he is. The Erie Art Museum Blues and Jazz Festival is a "green" festival. "That's what we kind of pride ourselves on," says Eller. "We take special effort to make sure that we are informing festival guests that we need to be recycling, taking care of what we have… I have restrictions on vendors for what kind of supplies they can buy. They have to use compostable utensils, they have to use paper, they cannot use foil- things that you wouldn't think of that really make a big impact." "We encourage people to use public transportation or ride their bike. We have a bike corral so people can safely leave their bikes," says Vanco. Parking at this event is notoriously tricky, and driving after drinking is just plain stupid, especially since every cop from here to Mahajibee will be looking for you. Do yourself- and mother Earth- a favor, leave the car keys at home. Let's face it—this festival will leave a carbon footprint in the sky, which is pretty freaky if you think about it. Help reverse this nasty atmospheric graffiti by making a donation to Lake Erie Arboretum at Frontier Park. "We work with LEAF to encourage people to make a donation for planting trees, to offset their carbon emission impact by attending the festival," Vanco tells me. So give them a couple of bucks, and breathe easier. Literally. "Our goal is always to leave the park better than when we came," says Vanco. "So we have a big clean-up afterward that picks up not only the trash from the festival but a lot of other trash." 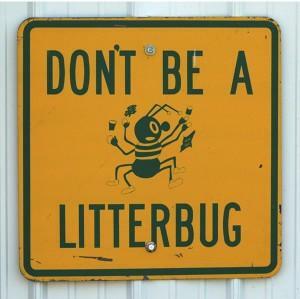 Do your part by disposing of not only your trash, but any other trash you see EVEN IF IT IS NOT YOURS. Vanco and the Art Museum are giving us this awesome, free, green festival, and cleaning up after us once it's over—the least we could do is make that part of their job easier.